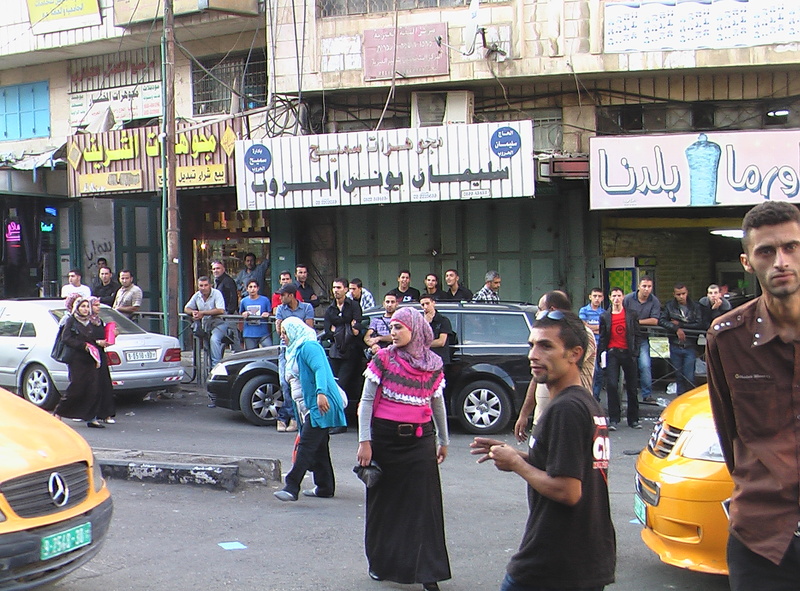 A crowded Palestinian marketplace, mid-afternoon, the sun is slowly descending, and a cool breeze blows plastic bags past the feet of a jumbled crowd of young men, small boys, women in hijab with their daughters, and old men. 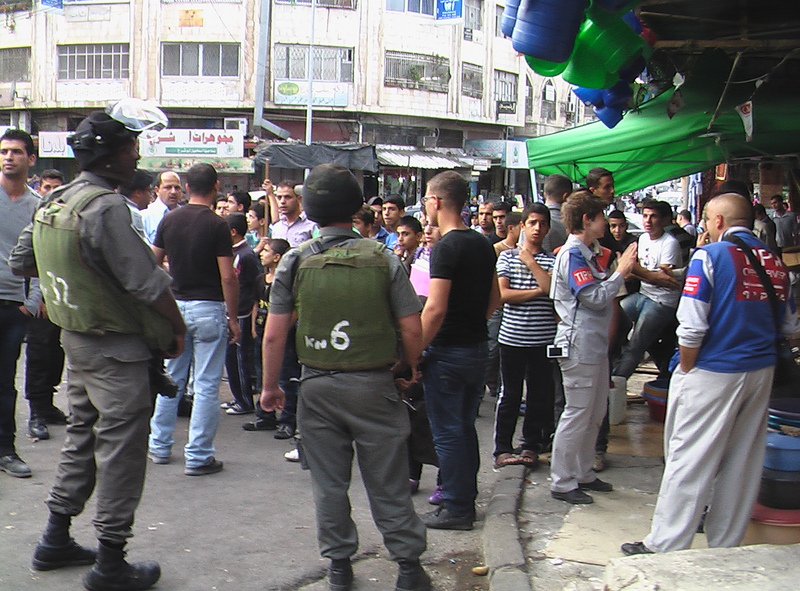 They have gathered, this midday mass of Palestinians, with outstretched necks and searching eyes, to stare at the Israeli army trucks that have mysteriously and inexplicably planted themselves in the midst of their crowded marketplace. 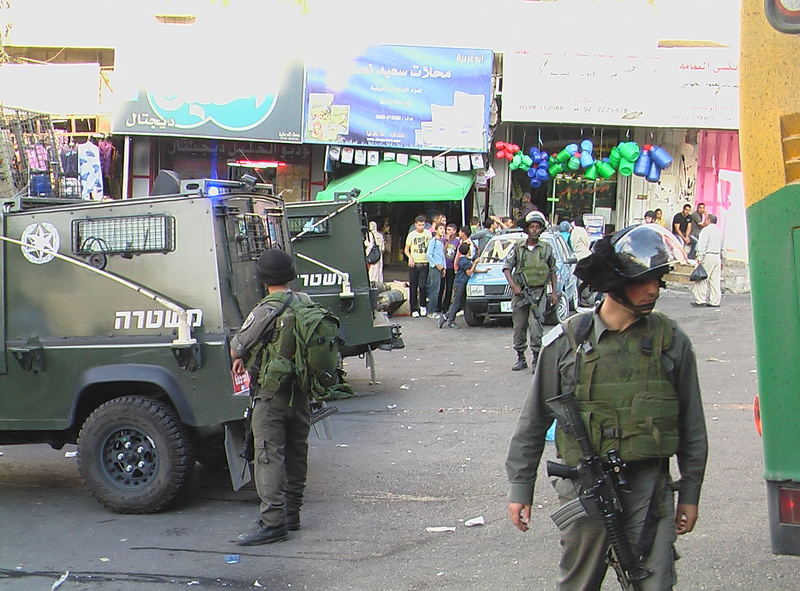 Israeli soldiers, nervous-looking young men and women in green army outfits with huge rifles, stand beside the heavily-armoured trucks, scanning the immobile crowd of onlookers with cold eyes stuffed under riot gear helmets. It is a Monday afternoon outside of Israeli checkpoint 56 in the middle of downtown Hebron, and the air is tense in Babi Zawya square. 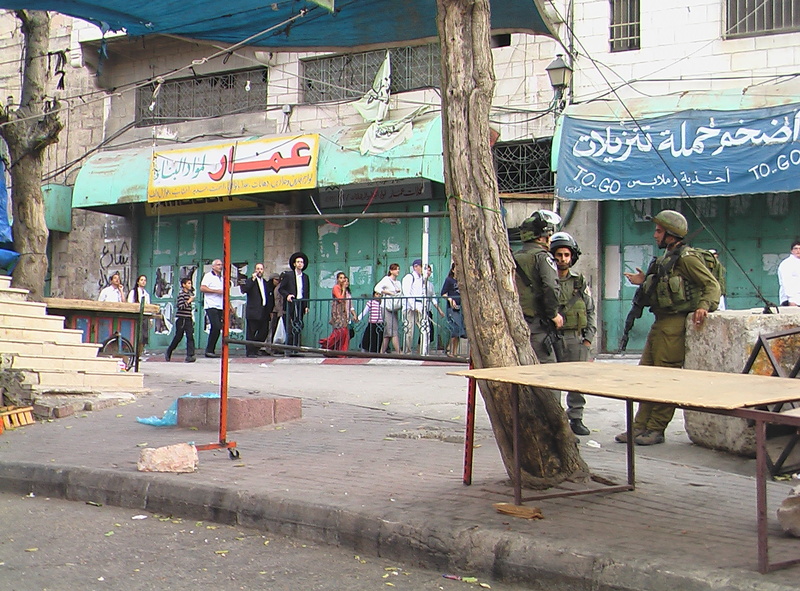 Though the square, since the Oslo Accords, is officially under solely Palestinian civil and military control, there are Israeli soldiers on the ground and on the rooftops surrounding the market square, pointing their guns out to the crowds and hassling Palestinians to clear the emptied street. Two long tour buses have parked themselves sideways behind the army trucks to serve as barriers, blocking the Palestinian gaze from the hallowed space the IDF has chosen to occupy. Palestinian policemen form a double barricade between the IDF and the Palestinian crowds, barking at kids on bicycles or old men who try to approach the checkpoint on their way back home. 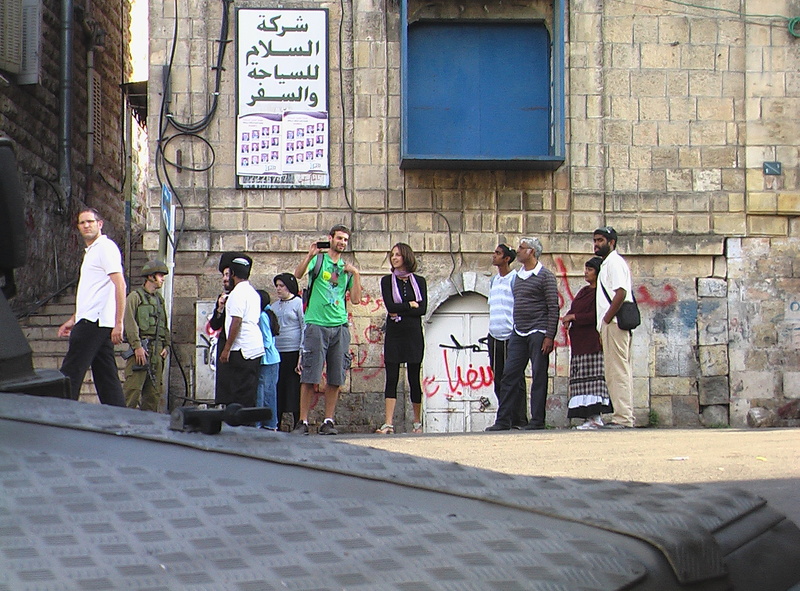 International activists from ISM, the Ecumenical Accompaniment Programme in Palestine and Israel, the Temporary International Presence in Hebron, and the Christian Peacemaker Team meander in and out of the crowd, taking pictures of the soldiers. Finally, the reason for the midday military shutdown of a major artery of Palestinian traffic and commerce begins to slowly trickle out of the checkpoint. 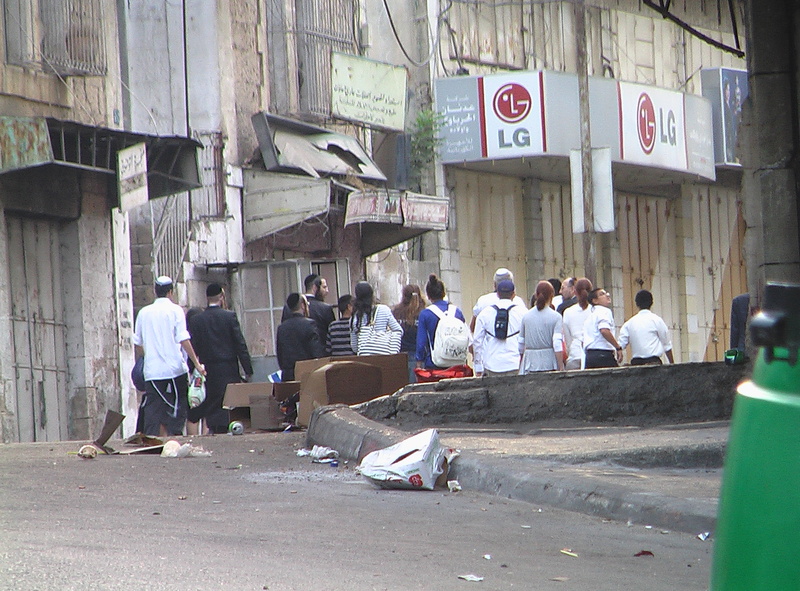 Bit by bit, what looks like a motley crew of secular Jewish tourists and religious Jewish settlers makes its way down the freshly deserted street. Streaming past recently abandoned shop doors littered with Arabic graffiti and plastered with posters of Palestinian martyrs and political figures, some of the black-hatted Orthodox men walk with downcast eyes and a hurried, nervous gait, like aggravated businessmen, trying uneasily to ignore the row of armed soldiers and the immobile, gawking inhabitants of a city that stand beyond; teenagers in t-shirts and kepahs (head coverings) amble by, leisurely and confident, with smiles on their faces and cameras in their hands, laughing, pointing at and filming the Palestinian crowd. 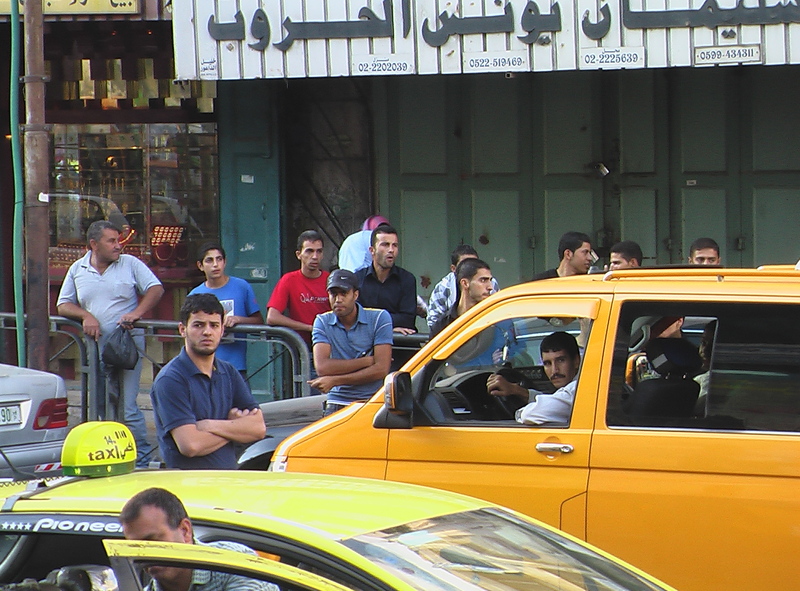 Bearded men in buttoned-up, tucked-in white shirts stand with their hands on their hips, glaring at the crowd of Palestinians and waving angrily at the soldiers, as if to ask why the Arabs hadn’t been completely expelled from sight; traditionally-dressed mothers walk with smug confidence alongside little children, who are gleefully enjoying an afternoon stroll. In a repetition of history as ironic as it is tragic, this tour treads on occupied territory to visit the grave of Otniel ben Knaz, an ancient Jewish Judge who, in the Biblical Book of Joshua, conquered the Canaanite city of Kiryat Sefer, southwest of Hebron, and drove out the native Canaanites from their land. This is Hebron in a nutshell, and these are the two peoples, the unhappy neighbors who walk day by day and sleep night by night side by side, a stone’s throw from the other’s doorstep on this single patch of land- the Jewish settlers, who have the path cleared and the carpet laid for them by the Israeli army; and the Palestinian residents of Hebron, who, for the moment, are forced to stand still in the army’s crosshairs and stare, from a distance, after the steps of the occupier. 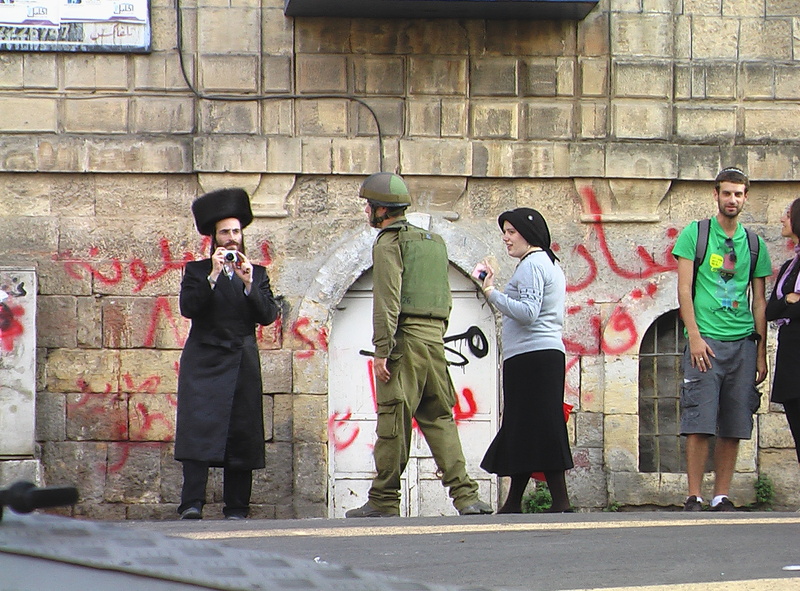 Settlers and Palestinians, occupiers and occupied, gaze at each other from across the street, the former like self-satisfied zoogoers, the latter with unblinking eyes that know right from wrong, that take into account, hold accountable, and count the days until freedom.